The HL-2030 is a laser printer perfect for the home or office environment. 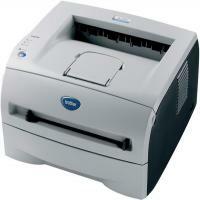 This low cost black and white laser printer produces high quality text. Brother HL-2030 toner cartridge has long life span. The design of this printer is quite small and will easily fit on the desk of a home office. The device comes with a fold-out extension tray to keep the printed pages safely without any damage and falling them off from the printer. It has quite easy installation. The speed of printing text documents is 16 ppm having a resolution up to 2,400 x 600 dpi. The Brother HL-2030 printer has a paper tray capacity up to 250 sheets and it also contains a expansion slot with the storage capacity up to 500 sheets. It has only USB port for connectivity options. Brother HL-2030 toner cartridge has the capacity to print up to 2,500 sheets of paper. This printer can convert colour images to grayscale using fine approximation. Brother HL-2030 printer best suits for households and home offices that do not require any heavy graphic printing. Long life span of Brother HL-2030 toner cartridge reduces the running cost of the printer. How to change the drum unit? The Brother HL2030 printer is a good and useful addition for offices as well as residential workplaces. Brother HL2030 toner cartridges are shipped along with the printer. But after a certain period of time you will observe print quality issues like blurry prints or prints with black spots. These might be caused due to low ink levels but chances are that the drum unit of the printer needs to be replaced. If you experience such an issue and do not have a new drum unit handy then you can buy a new one online. Along with the drum unit the company recommends the use of original Brother HL2030 toner cartridges for a prolonged good print quality. It is also to ensure a longer lasting quality of the drum unit and other internal parts of the printer. Turn the printer on. When the drum unit requires replacement, the Drum LED will be blinking. Press the front cover release tab to open the front cover of the printer. On the control panel of the printer, press and hold down the Go button for atlas 4 seconds until all the LED lights are on. When all the LED light lit up, release the Go button. Take the toner cartridge and drum unit assembly. Place it on a piece of paper or cloth. This to avoid contact of the toner with your clothes or the areas. Push the blue lock lever on the drum unit and carefully take the cartridge out of the unit. Handle it with care. If the toner accidentally scatters on your clothes or hands then immediately wash it off with cold water. Warm water will fix it onto the clothes making it impossible to remove. Keep it in a pack or wrapped up in a paper. Take the new drum unit out of the pack and put the Brother HL2030 toner cartridge you had kept aside, into the drum unit. If it is placed properly then the blue lever will lift automatically. Put the drum unit back into the printer and close the front cover of the printer. The Drum LED light will now turn off. Q. What types of media are supported by the Brother HL2030 printer? A. This printer supports printing on Plain Paper, Bond Paper, Recycled Paper, Transparencies, Envelopes and Labels. Q. Can you tell me what is the printing speed of the Brother HL2030 printer? A. The Brother HL2030 printer can print up to 16 pages per minute on A4 size paper and up to 17 pages per minute on Letter A Size paper. Q. What is the use of a DRUM unit? A. The drum unit is used to transfer the toner to the paper. The Brother HL2030 printer puts the toner on the roller inside the drum unit, and then prints letters and images by fixing toner to the paper by heat and pressure. Q. The toner LED of my printer is lit. What does this indicate? A. When the Toner LED of the machine is lit, it means that the printer has run out of toner or the toner is not evenly distributed inside the cartridge. Q. I do not have a credit or debit card. Is there any other way I can still make payment for your compatible Brother HL2030 Toner Cartridges? A. You do not need to worry. You can still make payment for our compatible Brother HL2030 Toner Cartridges via PayPal, Laser card or Delta Debit card. Q. What are the differences between original and compatible toner cartridges? Is there any risk in using your compatible Brother HL2030 toner cartridges instead of the original ones? A. Our compatible Brother HL2030 toner cartridges are much cheaper to purchase compared to the original Brother cartridges. Furthermore, our compatible cartridges are more environmentally friendly and provide the same output as the originals do. You can use our compatible cartridges without worrying about any risk. These are FSC tested products and come with a money-back guarantee, thus ensuring their quality. Q. Can I store Brother HL2030 toner cartridges (TN2000) for more than six months in case I purchase them in bulk but don’t have immediate requirement? A. Yes, you can go ahead and purchase these cartridges in bulk as you can store them for up to 24 months and still find them in good condition. Q. What procedure is used for creating compatible Brother HL2030 toner cartridges? Does it really make them cost-effective and dependable? A. These toner cartridges are made by assembling previously used components after cleaning them intensively and subjecting them to stringent tests by experts. Only those cartridges that qualify are okayed and sold to customers. Since they don’t use too much of new materials, costs are naturally reduced. These toner cartridges have been proven to be of the best quality time and again, so you can rely on them. Q. Are compatible Brother HL2030 toner cartridges suitable for printing high-quality images or are they good only for text documents? A. These compatible Brother toner cartridges are perfectly appropriate for printing images with superior gradations besides sharp texts. Q. Are compatible Brother HL2030 toner cartridges (TN2000) harmless for internal components of printers or are original cartridges better in that respect? A. Compatible toner cartridges are wholly safe and gel very well with components in your printer; they are as safe as the original toner cartridges. Opting for the former will be a feasible decision as you will be saving more while printing and still enjoy the same quality. Q. How many pages can I print if I use compatible Brother HL2030 toner cartridges in my printer? Is the printing cost per page-wise lesser with compatible cartridges as compared to their genuine counterpart? A. You can print up to 2,500 pages with this toner cartridge. The cost of printing one page with compatible toner cartridges is 0.8p while you pay 2.2p per page with original toner cartridges, so compatible toner cartridges will help you save more.